A Clean Car makes you Feel Good. Wash as often as you need and keep your vehicle always looking good. For your convenience, 5-Star’s Unlimited Plans automatically renew each month, so you don’t have to worry about it. Payment based on purchase date. There is no long term contract you can cancel anytime and your plan will remain active until the next billing cycle. Each Unlimited plan is valid for one authorized vehicle. This vehicle is identified by its license plate. So it’s easy to wash as often as you want. Membership can be easily transferred to another vehicle. 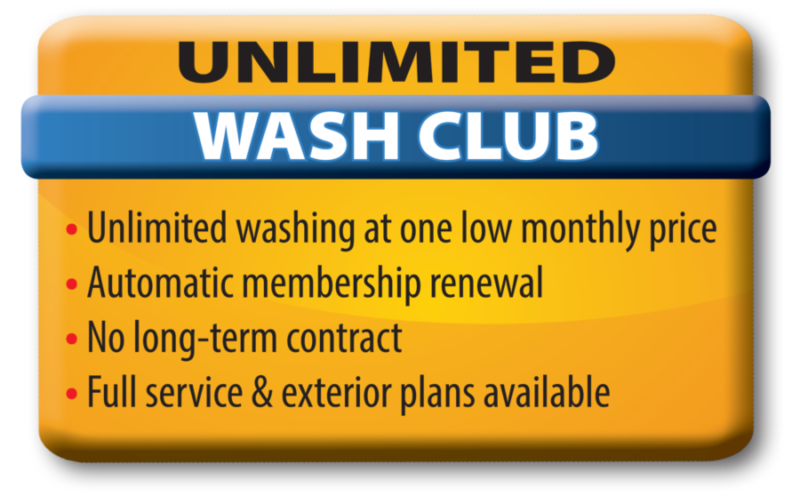 Up-grade to any other service by just paying the difference between the individual car wash price on your membership and the up-graded service you want. Membership is for one vehicle only, second and third vehicles can be added and billed together. Full Service Car Wash (Exterior wash, Interior Vacuumed, Wheels Cleaned, Windows in and out, Dash Dusted. 5-Star Car Wash will charge customer’s authorized credit or Debit card monthly. Based on plan selected. There are no statements issued to the customer with the Unlimited. Plan payment bills each month. The Unlimited Plan automatically stays in force until the customer cancels the plan. Plan will be cancelled if the monthly charge is declined by the card processing system. Any Unlimited payments shall be payable and are non-refundable regardless of use.Fleet vehicles such as Uber,Llyft, limousine etc., not included. Please contact us for pricing.